Don't worry, even people in amateur boxing wonder how amateur boxing lives with itself. 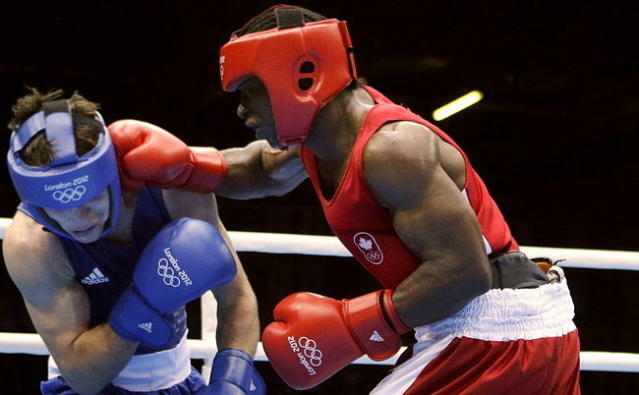 Well, in the wake of the women's soccer officiating fiasco on Monday, how else is Canada supposed to feel about Custio Clayton being done out of an Olympic men's welterweight boxing medal at London 2012 so, probably not coincidentally, the host nation's Freddie Evans could benefit by moving on to the semifinals. To review, Clayton and Evans fought to a 14-14 draw on Tuesday afternoon, with Canada's last remaining boxer winning the final two rounds. Evans was warned at least three times for putting a forearm around the back of Clayton's head, which typically results in a deduction. Yet the Welshman wasn't docked points — and won on a countback. Incorrectly cautioned three times? Don't you think a world-class referee, if that was the case, would have realized not to warn Evans again? Not to be too snarky, but there's a perfectly good reason with Clayton might have been coming in low: at 5-foot-9, he's two inches shorter than Evans. And talk about inconsistency in officiating; this is the same sport where another referee was banished for only giving one caution to a boxing later determined to have committed nine holding fouls. The decision is what it is and Clayton, from City of Lakes boxing club in Dartmouth, N.S., certainly could have better fate if the opening round had been scored closer than 7-2 for Evans. 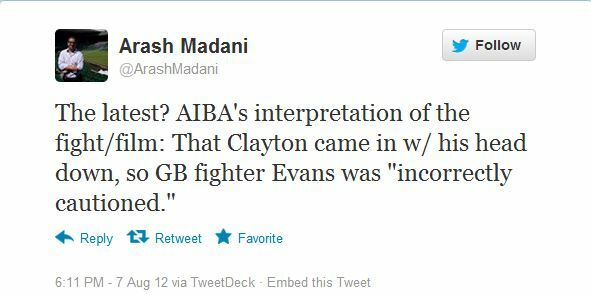 But this just affirms that Olympic boxing can stink like potato salad left out on a hot day. Canadian commentator Russ Anber also thought that Ukraine's Taras Shelestyuk shouldn't have had the decision over France's Alexis Vastine (who also appealed unsuccessfully) in the bout prior to the Clayton-Evans match. The upshot is that Clayton, being no stranger to the vagaries (yes, that's what we'll call it) of amateur boxing judging, is taking it well. Just reaching the quarter-final is a feat in itself for the young father of two, who's coached in his hometown by his great-uncle, Gary Johnson. Clayton, speaking before the appeal was announced, thought he had won the fight but wasn't ready to make a scene. "(Evans) had the crowd behind him, but after that crowd got out of the way, the second and third I thought I had it," Clayton said, even managing a smile for the assembled media. "I thought I pulled out the victory. I didn't get it, but hey, I did Canada proud and I did Nova Scotia proud and I just want to thank everyone that supported me and has been behind me." Clayton did allow that he was disappointed to be so close to a medal and have it seemingly vanish. Clayton's hometown and province can be all the more prouder of him for fighting capably. At the same time, a lot of people can be sick to death that this keeps happening over and over in Olympic boxing. It's not as clear-cut an injustice as some other decisions, but it's sadly typical. Meantime, it cost Canada a chance at its first boxing medal in 16 years.